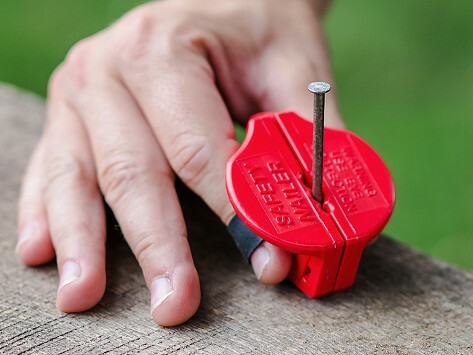 This magnetic nail holder lends a hand to make hammering easier and safer. It grips a nail for you, so you can preload one before you start swinging, and it keeps it straight and prevents it from buckling. (Try it with screws, too.) It also provides a better target to aim for. Miss hitting the nail? Don’t worry, impact-resistant ABS plastic can take it. Store the holder on your hammer between jobs. This thing is awesome! I used it today for the first time and wow!! It worked great. No more smashed fingers for me! Safety Nailer Makers Drew Zirkle and Dan Eifes leaned on their backgrounds as civil engineers—as well as Dan’s as a safety officer in the Navy—to make a safer way to hold and hammer nails. Along with their wives, Cori and Kristen, they created this simple and clever magnetic holder. It protects fingers and makes it easier to get nails started, and secures a nail (or screw) while keeping it straight and preventing buckling. The strike plate gives you a bigger (and eye-catching) target to aim for. Miss the nail? No worries. The durable holder is made from impact-resistant ABS plastic that can handle a hammer. The strap-on design fits on left- or right-handed folks and is small enough that it won’t get in your way of what you’re working on. Store it on your hammer between jobs.